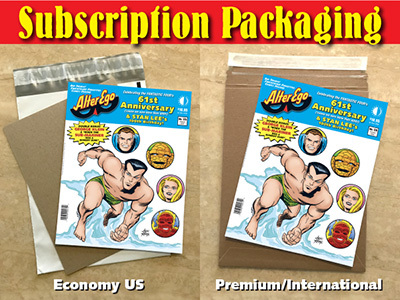 Alter Ego Subscription (6 issues Economy US) [Starts with NEXT issue] : TwoMorrows Publishing, The Future of Comics and LEGO™ Publications. ALTER EGO, the greatest 'zine of the '60s, is all-new, focusing on Golden and Silver Age comics and creators with articles, interviews and unseen art. Each issue includes an FCA (Fawcett Collectors of America) section, Mr. Monster & more! Edited by Roy Thomas.